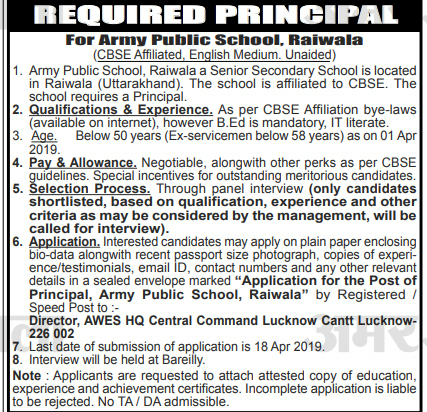 Army Public School, Raiwala Dehradun invites applications for filling up the post of Principal. Army Public school released notification for the recruitment of Principal post on a contractual basis. Army Public School Raiwala is a senior secondary school is located in Rishikesh (Uttarakhand). The school is affiliated to CBSE. Interested candidates may apply on before 18 April 2019. Qualification & Experience: As per CBSE Affiliation bye-laws (available on the Internet), however B.Ed. is mandatory, and IT literate. Age Limit: Below 50 years (Ex-servicemen below 58 years) as on 01 April 2019. 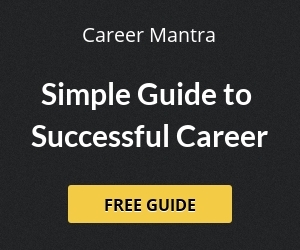 Selection of the candidates will be based on their performance in Interview. Only candidates shortlisted, based on Qualification, Experience and other criteria as may be considered by the Management will be called for Interview. The interview will be held at Bareilly. Note: Applicants are requested to attach attested copy of education, experience and achievement certificates. An incomplete application is liable to be rejected. No TA/DA admissible. Help us to improve this article/job posting "Principal Recruitment in Army Public School, Raiwala Dehradun". We would be glad if you can comment below and provide your valuable suggestions and feedback. If this page have any wrong information/list or out of context content, then you can report us as well.